If you play bingo these magnetic bingo wands are great for use with magnetic chips. Clearing your card is easy because all you have to do is run your magnetic wand over your bingo card and the magnetic chips jump on. Bingo magnetic wands come in Red, Blue, Green, Purple, Pink, Orange, and Yellow. Make sure if you order chips to go with these that you order magnetic, as our regular plastic chips (in tubs) will not work with these wands. These magnetic Bingo wands and chips are great for use while playing Bingo! Our magnetic Bingo chips and wands come in Red, Blue, Green, Purple, Pink, Orange, and Yellow. 100 chips per set with 1 wand. Want an alternative to magnetic wands & chips? 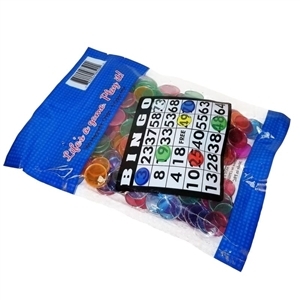 The Bingo Ball Magnetic Chip Set is the answer!!! Each bingo ball magnet has 100 magnetic bingo chips, and it doubles as the carrier. After you're done playing just gather the chips with the top portion of the magnetic ball. Screw on tight and you're done!